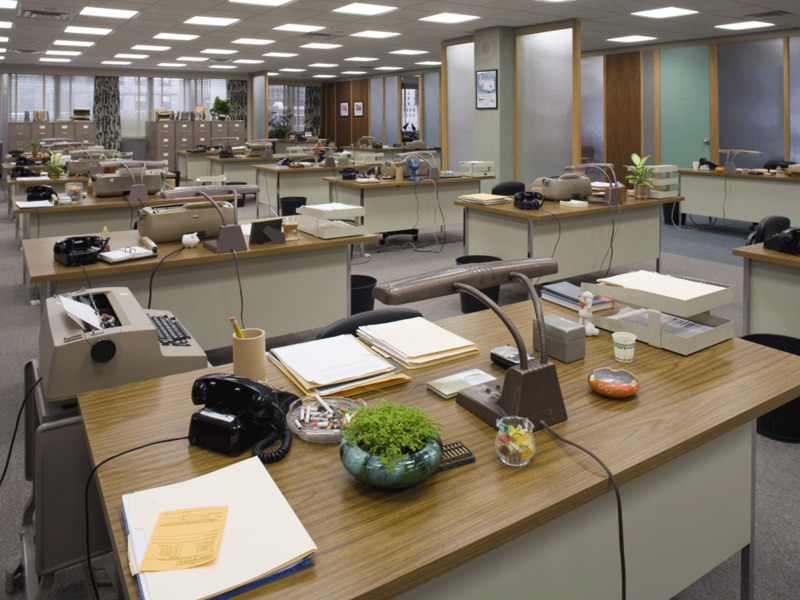 A Mad Dash To Decorate 'Mad Men' For Amy Wells, set decorator for AMC's Emmy-winning show — set in a 1960s advertising agency — life is one big scavenger hunt. She goes to great lengths to get the era's details just right — right now she's hunting for vintage Halloween decorations. 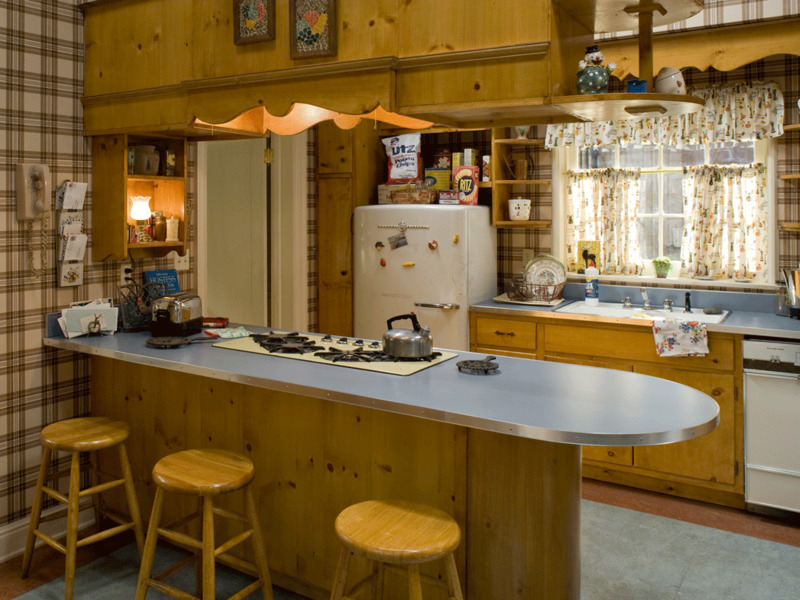 Amy Wells scours the thrift shops of Los Angeles for vintage accessories and appliances like these in Don and Betty Draper's kitchen on the Mad Men set. For Mad Men set decorator Amy Wells, life is one big scavenger hunt. The Emmy-winning AMC show is set at an advertising agency in 1960s Manhattan. Each episode takes seven days to shoot, and from the moment she gets the script at the week's first meeting, Wells is off and running, looking for period pieces that will lend authenticity to the scenes. "During that meeting, my blood pressure goes up really high, and I'm writing really fast and going, oh my god oh my god," she tells Melissa Block. "And sometimes I'm texting other people to start looking for things right away." Right now, Wells is scouring the thrift shops and garage sales of Los Angeles for Halloween decorations from the early 1960s. And she's just finished work on a vintage airplane interior that involved renting seats from a prop company and re-upholstering them in period-correct fabric. Mad Men creator Matt Weiner wanted wads of old gum stuck under the desks in the show's Sterling Cooper office for that extra touch of realism. Wells says show creator Matthew Weiner is not just particular — he's also obsessive and fanatic about getting every detail of the era just right. "But he describes himself and what he wants so clearly and with so much joy that you just embrace it," she adds. "Like last week, he asked for gum under the desks. He said, 'I don't want this place to look, you know, clean. I want it to be real — real.' He wants to show decay." Wells says that decay is actually a feature of Mad Men's third season, which kicks off this weekend. "We'll see if the audience notices it," she says, "but the carpets are dirtier — we weren't allowed to have them cleaned. The desks are more worn out. Everything has actually gotten the wear and tear of the last three seasons, and Matt loves it." It's not just the look that has to be absolutely right. It's also the sound. From the heavy metallic click of an old lighter to the buzz of an oven timer in someone's kitchen, Wells has to make sure the props sound as good as they look. The oven timer was a particular problem: Wells says that when the one on set didn't work, she had to hunt down an identical oven with a functioning timer so that the correct buzz would sound in that episode's soundtrack. Wells, oddly enough, is one of the few people on the Mad Men staff old enough to remember the era the show depicts. But she doesn't just rely on her memories when she's decorating a kitchen or a swanky office; she's got a vast library of vintage catalogs and decorating books. "One of the best references — we just used it this morning for the size of a baby blanket — is the Sears catalogs and the Montgomery Ward catalog," she says. "They're so specific, and they have all these items. And then I have every decorating book from the late '40s through the mid-'60s. So Better Homes & Gardens — you know, all those decorating books that came out every year — I have all of those." And if you've got any vintage junk stashed in the basement — Grandma's old Danish Modern side table, or a big chrome toaster — Wells wants to know about it. "I've used all the stuff that the prop houses already have," she says. "I'm always looking for new stuff."